Industry recognition of environmentally sustainable flower production has reached a new benchmark, with Freshcare announcing Brushtop Farm as its first “Flower and Foliage” member certified to the Freshcare Environmental Standard (ENV3). Freshcare General Manager, Industry Development, Clare Hamilton-Bate said the certification highlighted the commitment of the farm and was a positive step for the wider industry. Brushtop Farm is located in the New South Wales Southern Highlands and operated by WildFlowers Australia Chairman, Ben McInnes. Ms Hamilton-Bate said the Environmental Code of Practice Standard is outcomes based and designed to aid businesses like Brushtop Farm in demonstrating real environmental outcomes in horticultural production. 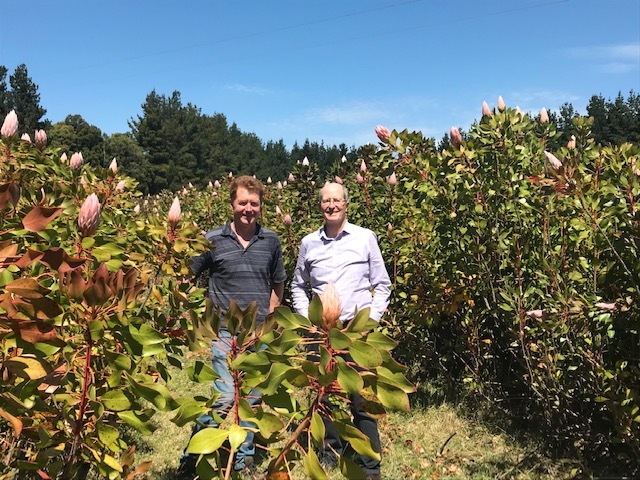 Freshcare has worked with members of WildFlowers Australia (WFA) over the past 18 months to develop an environmental certification option for flower and foliage producers. Mr McInnes explained that long-time WFA member Premium Greens Australia initially led the way, undertaking research to determine suitable environmental standards for flowers and begin work on standards for the sustainably managed wild harvest of native foliages. This work then fed directly into the development of the Standard which has now been finalised through Freshcare. Mr McInnes said the research highlighted the Freshcare certification was the best option for flower growers to show their commitment to environmental sustainability. He said the process of certification was simple enough and took only minimal preparation, as Brushtop Farm was already doing many of the things required. Mr McInnes said the Freshcare certification was not about cutting out all pesticide use completely though; it is about ensuring all activities are conducted in an environmentally responsible manner. “Consumers want to know where products are grown and that they have been produced appropriately. Other growers could use Integrated Pest Management for example, which allows for well-considered pesticide use. Mr McInnes said he recommended starting the certification process as early as possible. Mr McInnes said he knew plenty of businesses who were growing to a sustainable standard and would not have issues in gaining the certification. Ms Hamilton-Bate said Freshcare was looking forward to working with more cut flower and foliage producers on the certification process.